I am a Dirty Denier? I don't have the words. Berkeley Earth (BEST) team members recently wrote posts on a couple blogs to respond to criticisms. One of those posts was at Judith Curry's popular blog. I commented on it, raising some of the issues I've been discussing with BEST's temperature record. As you can imagine my discussions involved criticizing BEST. I don't know what possessed Mosher to make him feel it is acceptable to compare me to a Holocaust denier. I can't see how anyone would think doing so was a good idea. I raised legitimate concerns with BEST's work, concerns which show I have spent a not insignificant amount of time examining it. Nobody from BEST dealt with anything I said. This is what BEST did instead. Really? 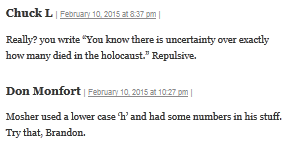 you write “You know there is uncertainty over exactly how many died in the holocaust.” Repulsive. Holocaust denier might not have been the right term to use there. I don’t know just how to word it correctly though. I’m still too shocked at how repugnant it was to worry about nuance right now. Because I wasn't sure just what "Holocaust denier" entails. To me, the phrase implies one denies the Holocaust altogther. I didn't want to exaggerate what Mosher had said, hence my clarification. Since then, I've found out "Holocaust denier" does in fact cover people who just dispute the number of deaths. That means my initial reaction was accurate. But what's more important is the fact I'm not providing links to these comments. That's unusual for me. I generally try to provide links to everything I quote. The reason I'm not in this case is I can't. My comments were deleted. Mosher's comment is still alive and well. The comments before and after my comment are still around. One of those comments, by Don Monfort, is still around despite responding to my comment which got deleted. I can't explain that. I can't begin to fathom why it is unacceptable for me to say, "Wow. 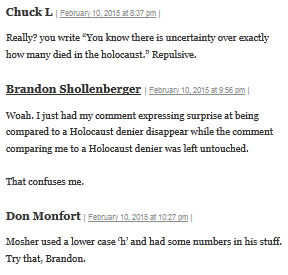 Steven Mosher compared me to a Holocaust denier." Apparently it is okay for Steven Mosher to compare me to a Holocaust denier, but it is not okay for me to be surprised or bothered by such a repulsive comparison. I don't have the words. I don't understand why BEST team members would ignore legitimate concerns people raise then turn around and compare those people to Holocaust deniers for raising them. I don't understand why anyone would feel it is okay for BEST team members to compare me to a Holocaust denier but not okay for me to say, "Wow. Steven Mosher compared me to a Holocaust denier." What I do know is this is completely ridiculous. It's their blogpost so I guess they are authorized to moderate as well. Why care - if he didn't intend the interpretation you've drawn then it's a storm in a tea cup. If he did, he's a tool. What does it matter either way? Why care – if he didn’t intend the interpretation you’ve drawn then it’s a storm in a tea cup. If he did, he’s a tool. What does it matter either way? It matters because character matters. Mosher, Best et al. are holding themselves out as nonpartisan, honest brokers if you will, in the analysis of the historical temp record. However, what Mosher/Best is doing is simply continuing the practice of obfuscation and misdirection started by their predecessors Mann and Jones. When questioned on Best's methods, Mosher turns to personal insults and drags out the holocaust denier meme so that he doesn't have to respond. "In other words we were getting smeared.. I get mail from users.cant just stay quiet when people are playing a guilt by association game. Mosher is a hypocrite, thin skinned and narcissistic and that's relevant to the discussion. There's absolutely nothing scientific (or honest) about drawing a parallel with being a holocaust denier. It's cheap and unbecoming. "I can’t explain that. I can’t begin to fathom why it is unacceptable for me to say, “Wow. Steven Mosher compared me to a Holocaust denier.” Apparently it is okay for Steven Mosher to compare me to a Holocaust denier, but it is not okay for me to be surprised or bothered by such a repulsive comparison." It is unacceptable for you to point it out because you're not Mosher and everyone knows that Mosher gets a free pass at Climate etc. I suspect if you started to moderate your views to that of a lukewarmer, you'd receive a great deal more latitude. Dissent is permitted at Climate etc.. provided it doesn't embarrass the clique. But you realize that the brandons of the world would remain skeptical. You know there is uncertainty over exactly how many died in the holocaust. You know there is uncertainty over exactly how many died in the holocaust. I hope not. I hope we can all agree what Mosher said was repulsive and should not be approved of. And of course, if we could all agree about that, it has a serious effect for BEST. This is a BEST team member defending BEST on a blog post BEST wrote. If BEST is of the view it is acceptable to compare its critics to Holocaust deniers in order to dismiss what they say, that makes BEST look stupid. It shows BEST has about the worst PR strategy possible. That said, look at Curry's tweet responding to me. If what she said was right, I might understand her actions. She said Steven Mosher didn't compare me to a Holocaust denier. If he hadn't, I could see why me saying he did might start a foodfight. I could maybe see why that would justify deleting my comment. I don't think it'd be a right choice, but I don't think it'd be a completely wrong one either. Even Mosher wouldn't dispute that was him comparing me to a Holocaust denier. It's just too obvious. What else could he possibly have been doing? I'd pursue an alternative line of reasoning and dialog. The question of numbers in the holocaust IS debatable precisely because, like the numbers associated with regional temperatures, the measurement is contaminated by politics. Do we count only Jews murdered by Hitler's Germans, and measure only regions experiencing warming? If so, we get one set of numbers. If we count Muslims (Tatars, Chechens, Ingushies, Balkars, Karachays, and Meskhetian Turks) murdered by Stalin's Russian in a somewhat broader definition of "WWII-holocaust(s)" then we would get a rather distinctly different set of numbers -- just as we might get if we distinguished and counted "cooling regions" or precipitation changes. The consensus about counting or measuring one specific set of numbers (6 Million Jews in camps) and not another (20 million Jews, Gays, Gypsies, Muslims and other victims of socialism in camps and GULAGs, ) is a consensus resulting from spotlighting Hitler and giving Stalin a pass. If being open-minded enough to look at the full historical record rather than the contemporarily-preferred subset of that record makes me a "denier" then so be it. A related issue is the prescription made based on the measurement taken. The politically preferred view of the holocaust is that having Jews integrated into Poland, Germany, Hungary, Russia, etc was a problem, and the removal of Jews to a partitioned reservation in half of what was then "Palestine" was a solution. Very similarly the integration of Muslims, Sikhs and Hindus in what was pre_WWII British India was considered, by the Indians at least, a problem, and the partition and segregation of the independent Indian nations post WWII into large enclaves was considered a solution. Racial segregation was looked at a solution, in much the same way that some now view carbon capture and sequestration as a solution. Perhaps, at least arguably, and in hind-sight, the costs of the solution outweigh the cost of the problem. But making that argument somehow makes one a "denier", or so it would seem. At most he was comparing your interpretation of uncertainty with people who claim uncertainty about the no. People that died in the Holocaust. Personally I think it would be foolish to profess certainty about how many people died in the Holocaust so even if his comparison was as you say, so what. Pouncer, I'd rather not act like comments like Steven Mosher's merit consideration. While there are parallels we could draw like you suggest, the reality is Mosher was just trying to smear me by associating me with a despicable group of people. Joe Goodacre, Holocaust denial includes people who just argue about the number of people killed in the Holocaust. As for the idea, "so what," Holocaust denial is bad. It is largely advanced by people like Neo-Nazis. It's my understanding it's been growing amongst certain sectors of radical Islam. That means Mosher is effectively trying to associate me with Neo-Nazis and terrorists to make people dismiss what I have to say by taking advantage of a terrible tragedy. Even if I didn't care about how repulsive it is to say something like this about a person, I'd care about how disgusting it is to trivialize millions of deaths by using them as nothing but a cheap rhetorical device. The reference was obvious, others saw it and commented. Because you choose to interpret it a different way doesn't make it so. You're welcome to repeat your comments on the original post at Climate Etc. but if Brandon Shollenberger wants to come to his own blog and comment, what concern is it of yours. You don't speak for me and others who want to read about it. To be fair to Joe Goodacre, you can pretty much always ask, "So what?" You could respond to every post I've ever written with it. It's basically the infamous tactic kids apply when they ask, "Why?" in response to everything you say to them. It's not wrong. If I had been called a murderer and wrote a post expressing surprise at that, Goodacre could always come along and say, "So what?" I have no problem with people doing that. If I don't want to answer, I won't. Of course, if Goodacre ever questions any results I publish from here on, I might turn around and say, "You know there is uncertainty over exactly how many died in the holocaust." You have the ability to do technical analysis that many people don't. I mostly enjoy your technical analysis and prefer to read that. Obviously it's your prerogative as to what you write about, however I would suggest that if holocaust denier includes people who are uncertain about the number, then the term is meaningless and any sensible person wouldn't give two hoots whether someone else suggested they were that. Joe Goodacre, it is trivially easy to show "Holocaust denier" does cover people who merely argue about the number of deaths. It is trivially easy to show many people do care about being compared to a Holocaust denier. Given neither of these points can be sensibly disputed, I don't know where you get your view from. Regardless, it took me all of maybe 20 minutes to write this post. If people don't want to read it, they don't have to. That won't affect their ability to read other posts they might want to read. My grandparents hid jews in the attic while feeding the german soldiers who were occupying the house. I don't think people understand how vulgar a term it is to some. The irony is that it's used by ideologues to marginalize their opponents...kind of like some european dudes from the 30s used to do. Steven Mosher lost the argument long ago. Armando, I can't disagree with that. I wouldn't have written this post if it were just about what Steven Mosher said. It wouldn't have been worth the trouble. Is not. And that is certainly something worth remarking on. If nothing else, having this post means I can reference it when I respond to anyone who expresses any doubt about anything I do by saying, "You know there is uncertainty over exactly how many died in the holocaust" since we've now established that's acceptable behavior. email me sir - need your assistance. Mother believes he is righteous and correct. He believes he has not lost the argument. Far from it, he believes he dominates it.